Vegetable gardening is such a satisfying experience. There is nothing quite like biting into a tomato that was just picked from your garden. The flavor is nothing like that of the ones bought from a store, even the vine ripened ones. 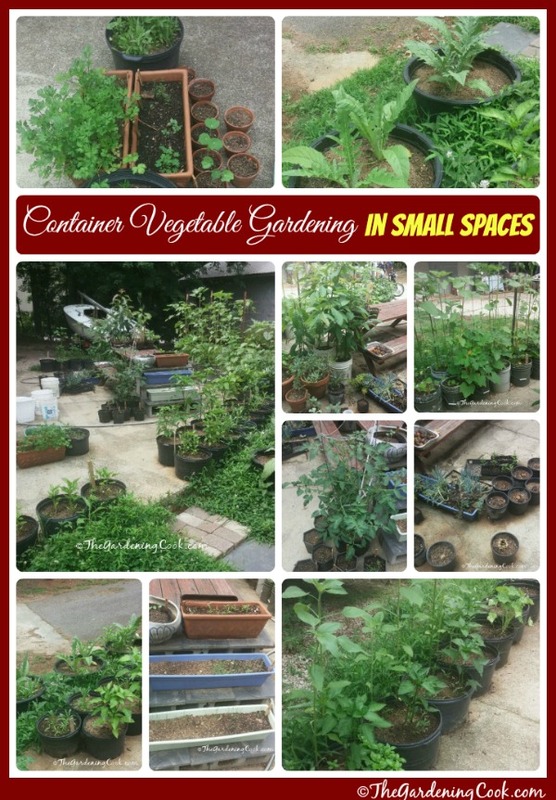 Container Vegetable Gardens are a great way to garden when your yard is small. Getting the most bang for your buck in a small garden is a challenge. 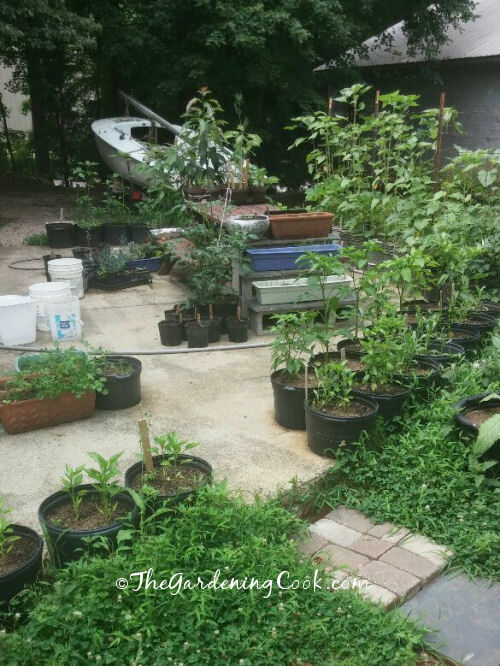 So, what do you do if your yard does not have room for a big vegetable garden? All is not lost. 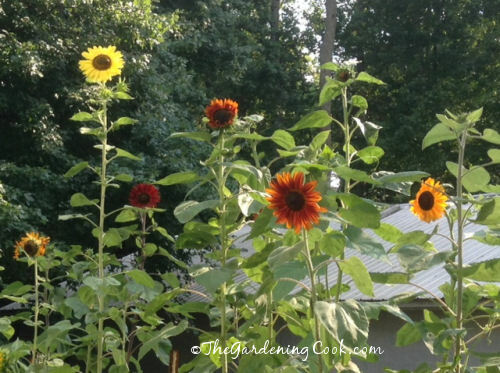 Try container gardens instead of using your yard. If you like to grow vegetables, be sure to ready my post about how to troubleshoot vegetable garden problems as well as some solutions. How to set up container vegetable gardens. I recently visited my friend, Meri King, who has quite a large yard but has very little sunlight coming in to it because of the trees on her property. Her main area of sunlight comes right on to her back patio. But she loves to garden, especially veggies, and so she grows everything in pots. The area of her patio is about 15 x 15 feet or so and most of it is laid cement. Meri King has all manner of vegetables as well as a few of her favorite flowers and fresh herbs growing there – all in planters. 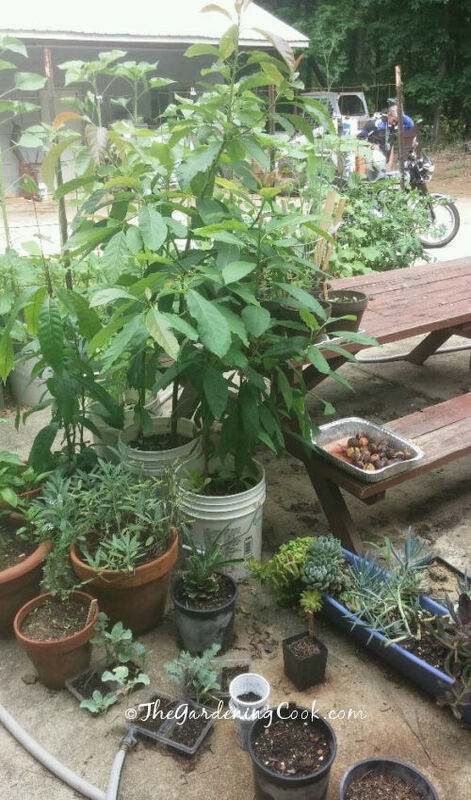 Grab a cup of coffee and enjoy my tour of her small space vegetable garden. It may give you some ideas if you, also, have light or space constraints that have kept you from growing vegetables. These are her tomatoes. 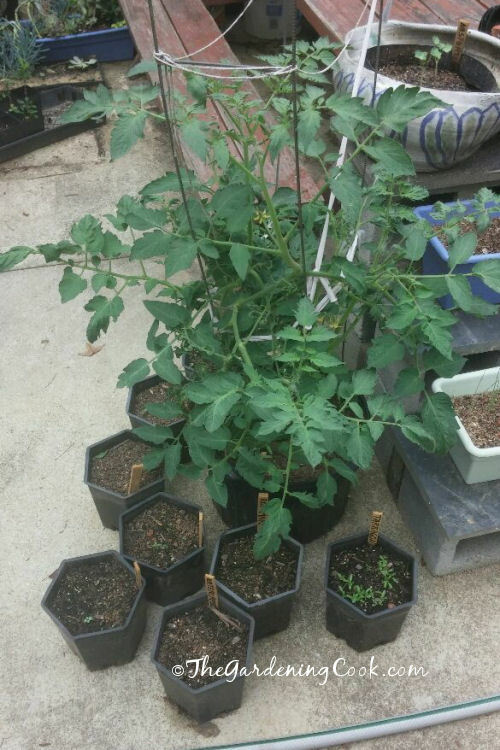 Some are just planted, a couple are seedlings and the biggest one was given to my friend by another friend of ours, (waving at Randy) who has a huge vegetable garden. It’s already blossoming! This area of the patio contains large planters with well developed peppers and artichokes. The long blue planter contains succulents (She gave me some leaves to grow varieties I did not have myself.) And the large pots are avocado pits. The pits came from store bought avocados and have not yet sprouted. These are some larger avocados, also grown from pits. Meri King knows that they will not produce fruit, since one needs grafted avocado plants for this to happen, but they do make great container plants and are such fun to grow if you have a child. 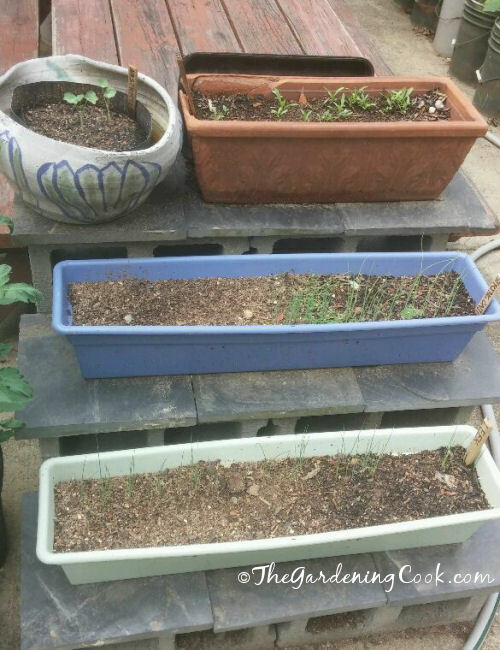 These planters don’t look like much right now but there is new growth of both leeks and spring onions already. The top planter contains tarragon. This area is mainly herbs. 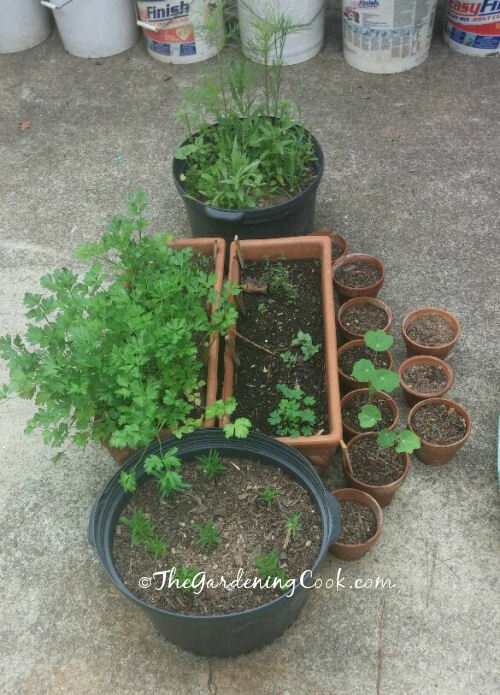 There is parsley, and dill as well as nasturtiums. The nasturtiums will attract beneficial insects to the garden to help with pollination. 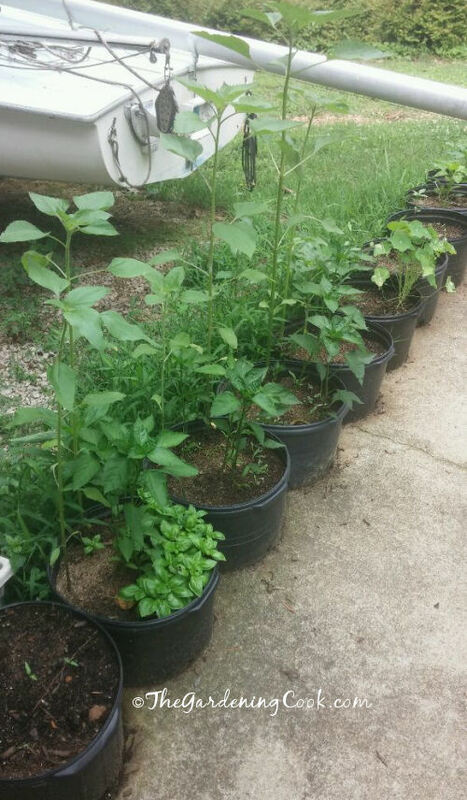 Along the back of the patio, my friend grows sunflowers, basil, and more peppers and nasturtiums. 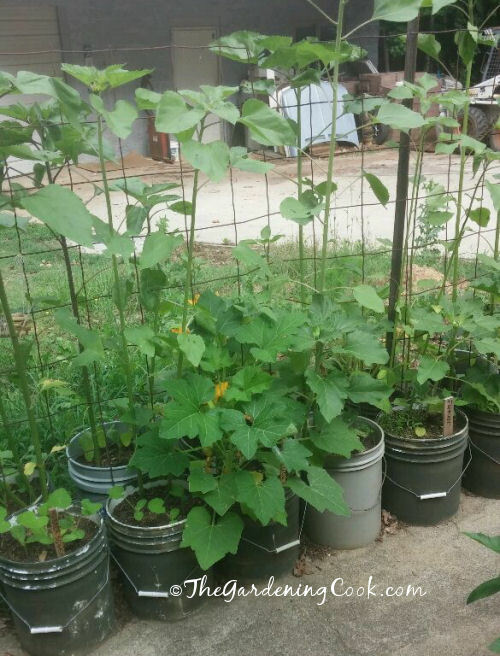 This photo shows sunflowers and squash. The tendrils of the squash will actually climb the sunflowers in time! 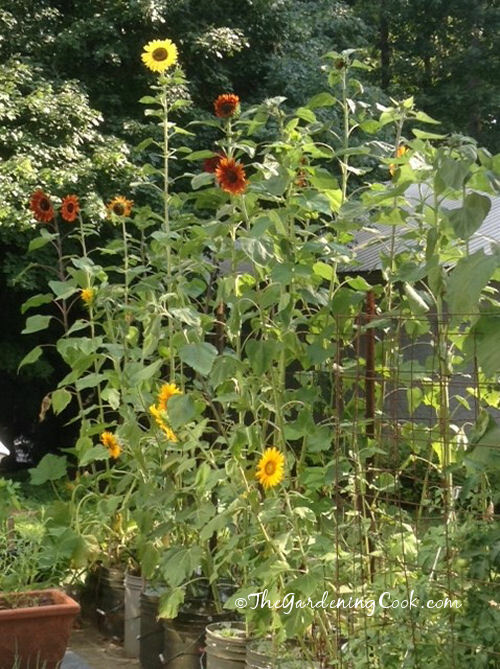 This is an updated photo of my friend’s sunflowers in bloom. What a pretty back drop they make! And a close up of the flowers. I love the combination of colors. 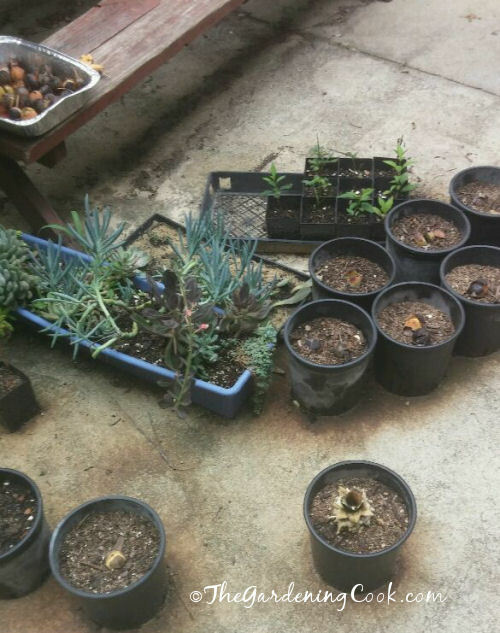 These photos show that you don’t need a large garden area to grow veggies. Try container gardening. Even with my big planted garden, I still grow some of my favorite vegetables in containers on a deck garden. 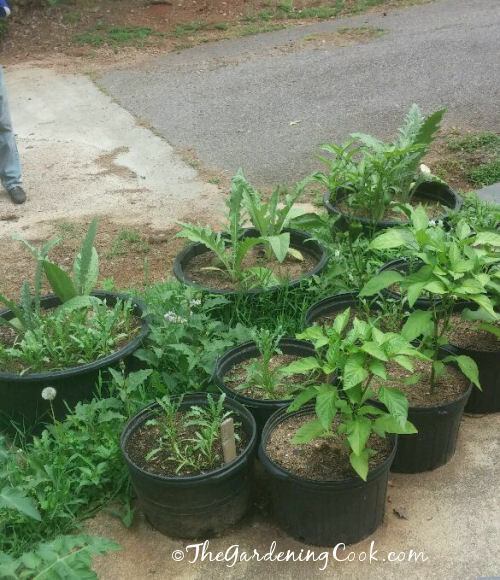 This year I have all types of herbs, as well as big tomatoes and a cascading tomato plant. And many thanks to my friend Meri King for the delightful tour of her container vegetable garden! 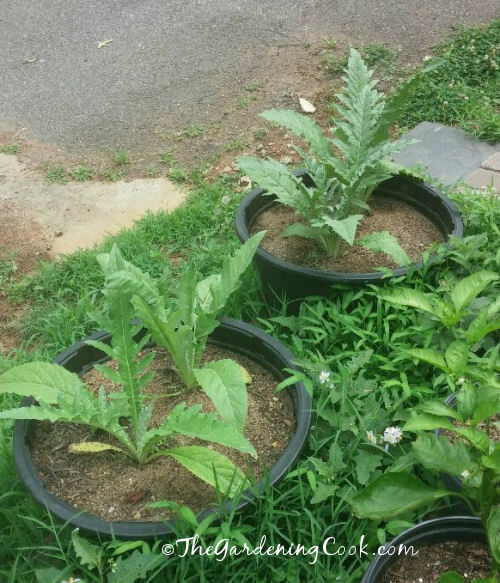 Have you ever tried container vegetable gardens? Please leave your experiences in the comment section below.